This is one of the most innovative gastronomy trends, a must in the best restaurants. Though his young age, Oriol Balaguer is considered to be one of the great masters of this new professional style. He has led the revolution making the move from shop patisserie to restaurant patisserie as a natural evolution of his frantic professional path. The book has beautiful presentation and modern design, along with the high quality photographs, making it fascinating and will take you into the world of dessert cuisine. Oriol Balaguer has extraordinary command of raw materials that allows him to optimize its use and yield. He gives a clear presentation of the necessary ingredients, describes the preparation methods with precise instructions for techniques used and makes comments and advice to consider for perfect preparation, assembly, serving and consumption. Dessert cuisine is a revolutionary concept whose complexity is displayed through such daring creations as his ìbigarreau cherry soup with cream cheese sorbet and beet, tomato ravioli with yogurt sorbet and basil and curry chocolate lollipops. 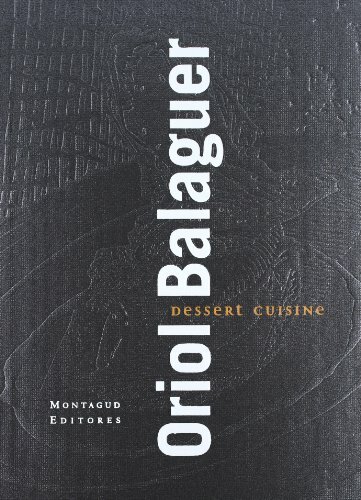 This book is the best proof of Chef Oriol's boundless genius and indisputable talent. If you have any questions about this product by Montagud Editores, contact us by completing and submitting the form below. If you are looking for a specif part number, please include it with your message.